Born in Colombia Juli, an Anthropologist is living and working in Argentina since she was 19. Football it’s her revolution: not only it does make her happy and complete but it’s also her weapon to contribute her grain of sand to the struggle for equality. When she plays football she feel alive and free. She graduated from a class of 86 students where she was the only woman. It was not easy and very challenging. But it was amazing for her to learn so much and to open some of those minds that where not very welcoming a female coach. 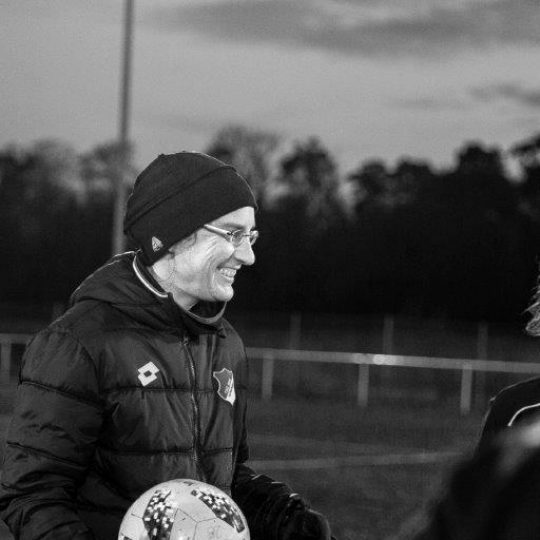 Together with Monica Santino – a woman with a tender and determined look who knows that soccer is much more than a ball – they founded La Nuestra Futbol Femenino in 2012. 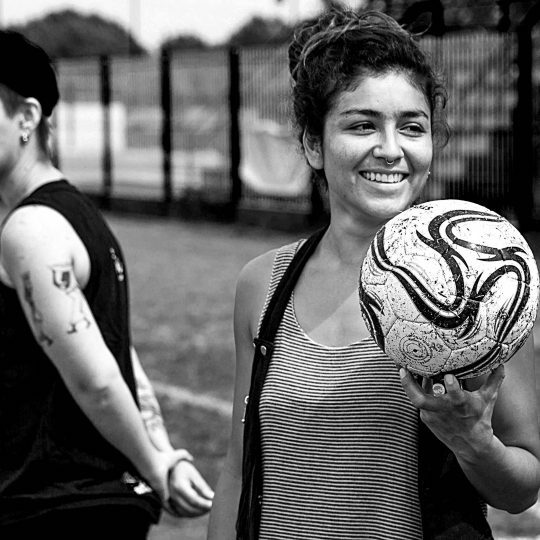 La Nuestra Futbol Femenino is an NGO that was born with the intention to promote women’s football in pauperized neighborhoods of Buenos Aires. Its main goal is to use women’s football as a tool to empower women and work towards gender equality and to fight violence against women. Their pitch it’s a safe place now even for single mothers or gay women who are trying to escape their environment for a while. Football in Argentina is a cultural asset, it is something very important, to pretend that women are outside a cultural phenomenon of that nature is illogical. And the beginning of La Nuestras path was tough. In Argentina they were forced to play in men shirts. The pitches were unlighted. All times for practicing football on the field were reserved for man. These girls started to defend themselves and claimed the pitch for them only. Once these boys threw stones and sticks on them, one girl got injured. They left the pitch, but the next day they came back and stood their ground. Male resistance shrank and today La Nuestra is practicing 3 times a week for two hours. 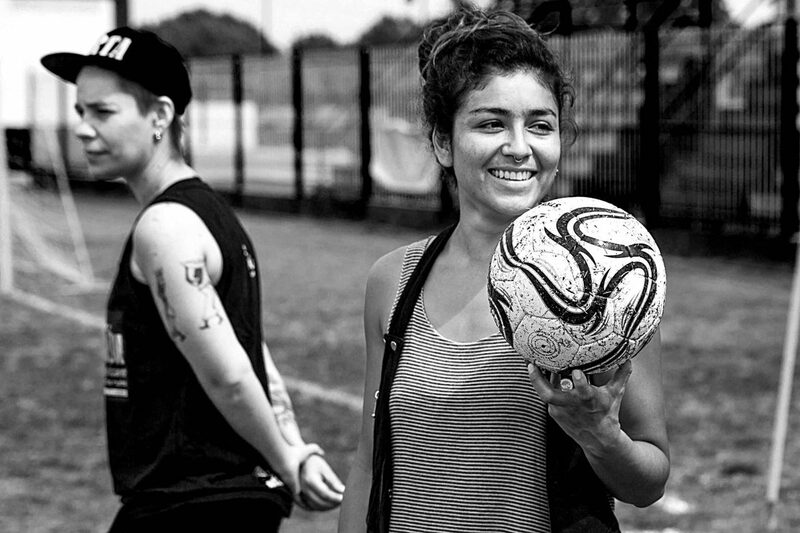 These women claimed their right to play, their public space for something they love to do. It’s a political decision to dedicate oneself to play football and create space. Sport should take more space on each feminist agenda. This work it’s fun. 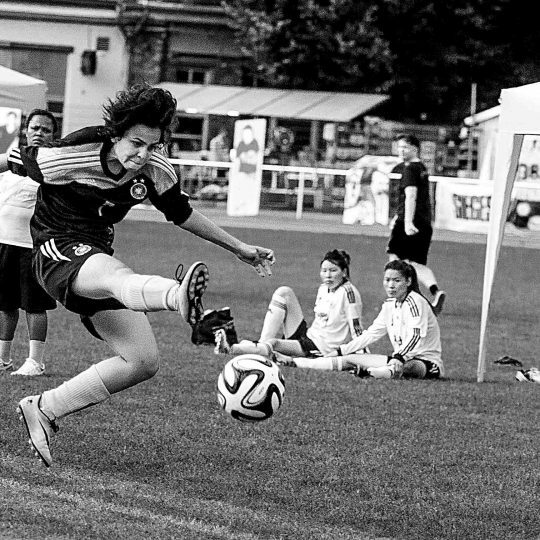 And football is Juli’s passion, through football she can express herself. For her it’s the beginning only. One day she could imagine herself as politician. Whereat, she and all these women fighting in that space as politicians already. Without mandate, but with many ideas. And especially with a lot of patience.